I'm not sure where to look. Can someone help me find out information about annealing cartridge brass? I knew a man about 15 years ago that did some for me. But I'm not traveling that way now. I'm thinking of getting my own machine. I sit in a dark room with a blow torch. Twist the brass quickly in my fingers at the shoulder and neck. When it srarts to glow a slight maroon or gets too warm to hold i drop it into a pale of water. Works great for me and I only loose brass to primer pockets getting worn out. Hornady had a real simple system that worked quite well for small batches. I have one, but it's been discontinued. Check it out - you can see that a socket of the proper size would work just fine. As for a machine, just Google "Annealing Machine" and you'll get all sorts of information. Grumpa a member hear I believe does this but I may be mistaken . Last edited by toallmy; 09-13-2018 at 08:21 AM. Grunpa a member hear I believe does this but I may be mistaken . 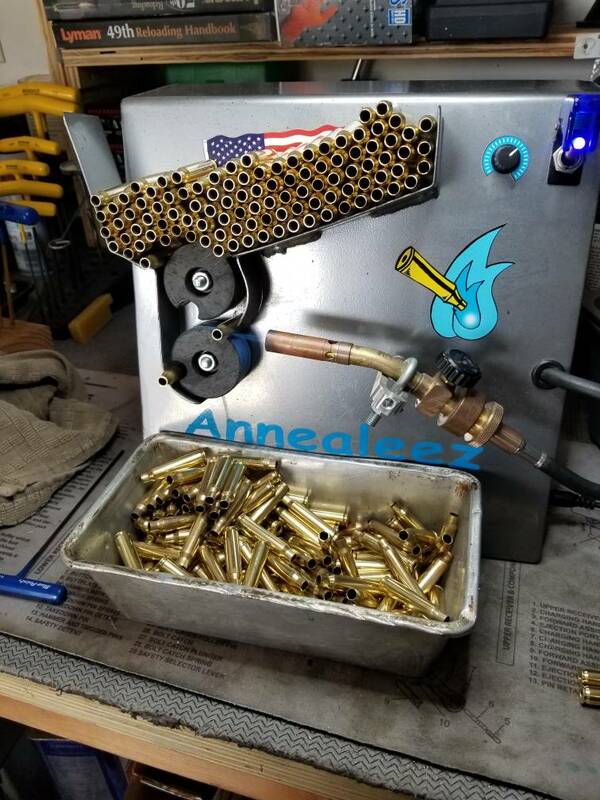 Almost all my rifle brass, (how about 2, 5 gallon buckets of brass) needs to be annealed. They're splitting the case necks like crazy. I decided to not load any more until I can anneal the rest of them. Owe, thats a lot of brass. I can see your desire for a machine. I do batches of hundred about ever third or fourth reload. go to the "search" function on this site - type in "annealing brass" - then hit the search button . . .. There's at least 10 pages on it and all kinds of information. Its GRUMPA by the way. And I can only do 2 types (sizes) since that's all the wheels I have. The first is for the 30-06 based cases, the second is for 223 based cases. Those wheels cost something like $80ea, and if I don't own anything in a specific size why spend the money. I bought an annealing machine during the Obama shortages, most due to everyones QC getting worse. I got tired of new Winchester brass splitting the necks on the first loading. Accurate Shooter.Com and Varmint Al both have lots of info on annealing. I bought the Giraud machine, partly because I liked his trimmer and partly because I liked the ability to fill the hopper and do something else. Now, if you have a machine with an open flame running, you should stay close to it and I do. If you have that much brass to do you can justify the cost of a machine. If you have lots of time you can anneal cartridge brass in molten lead. A machine is nice though. To anneal in molten lead I dip the case neck and shoulder in a thin oil and then holding it with pliers I'll dip the neck and shoulder into the molten lead and count one thousand one, one thousand 2, until I get to 7 or 8, then drop the case into a tray and grab another. Its cheap and simple but labor intensive. If you buy a machine I suggest buying some of that temp sensitive paint to help you adjust your machine. I also suggest saving some junk cases to use for set up. I've seen some promising information on salt bath annealing. This and a bottle of 750° Tempilaq takes all the guess out of the process. I had the same problem with buckets of brass that could use annealing and not enough time to do it . Getting a bench Source "Vertex" solved the problem and once adjusted using a few scrap cases and Tempilaq it turns out cases very fast . You do have to stay and feed it though . I want to thank everyone for your input. There is a case annealer in my future. Just not real sure which design, if I buy one. But the photo above in the thread is probably what I will build. The machines are nice and work well. Annealing is simply a time versus temp. the longer time in heat the lower temp you need to a point. Torches with a socket or holder work but depend on you ability to see color changes, and even in a dark room looking at the flame changes vision some. The machines take this out of the process. I use a variation of the salt bath. a lyman lead pot with a sheet metal rack to hold cases filled with glass making sand. set the pot to 750* with a lead thermometer and warm up to temp. Insert cases around circle removing one and inserting another. Each case get about 15 seconds at 750*. I use a 1/4" deep well socket that fits the brass I'm working, clamp the torch it the vice, chuck the socket in my battery drill, drop the brass in the socket and spin it in the flame. Drop and repeat. Goes pretty quick.